Size: Diameter 3-1/8", Height 5-1/2". The Diameter of Opening hole 1-1/2"
LED bulb design, beautiful and elegant. Rural style, give you a different life of emotional appeal. Create a fashion life atmosphere, Make your life more poetic and relaxing. Also modern design to any place. Fits for hanging in the bedroom, living room, office, it also helps beautify and purify your house or office, a good decoration for you. This glass vase can be decorated by dry flowers,water plants or any pretty items. There is an open mouth on the vase so you can easily put something into the container. 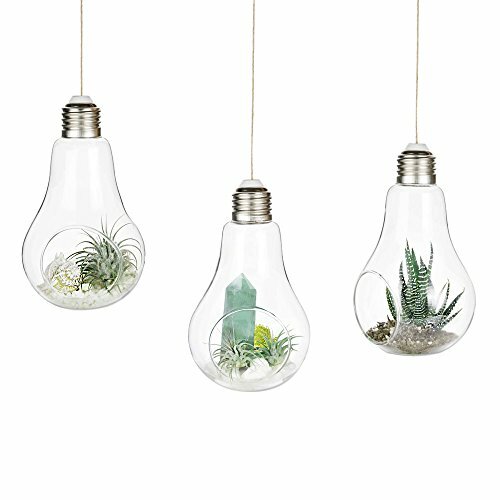 Playful yet afforable items to refresh your house. Also great to give as a unique house warming gifts! Please note that this item is not include plants and accessories! Great for succulent, air plants (Tillandsia, Bromelaid family). More perfect if matched with white rocks, pebbles or acrylic. Suitable for the balcony garden, furniture, home gardening, ect. Creat a fashion life to your home. Also perfect for sending to your dear friends or family as gifts. Size: Diameter 3-1/8", Height 5-1/2". The Diameter of Opening hole 1-1/2". Mkono is a registered trademark and our product is professional manufacturing and sole selling.